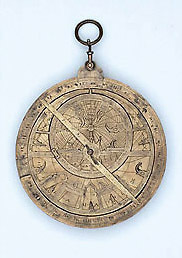 This astrolabe presents typical Moorish features such as the rectangular mounts for the four star pointers on the top of the rete. Nonetheless, the engraving is partly in very bold Lombardic script, though also in a distinct lighter script. The rete and a plate for the latitude of Paris are engraved with this latter script, so it is possible that the instrument had been adapted, the rete re-engraved and one of the plates made (or re-engraved) for a later French owner.